Total back length (top of zipper to hem): 22½"
Fluoro yellow twinkle satin bolero style bodice with black Celtic knot-work embroidery design. Sleeves and top of bolero bodice constructed from black and gold leopard print sequin overlaid on yellow satin. 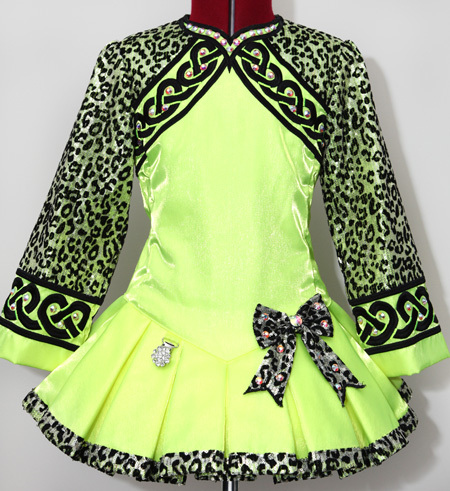 Modern style wave skirt constructed from fluoro yellow twinkle satin with matching leopard print sequin bind. Gorgeous matching sequin bow attached to left side of dropped waist point. Asymmetrical yellow twinkle satin and leopard print shawl with matching embroidery. Immaculate condition. Made in July 2012. Worn 5-6 times only.